The terrace formerly known as Thirlestaine Place, named after the large mansion nearby, dates from at least the early 1830s. In 1833 this property belonged to a chemist called Mr Mountjoy, a member of the London Royal College of Surgeons, who made his own proprietary cough drops "recommended for those who are in the habit of public preaching, speaking and singing". In 1846 a baker called Mr E. Giles died at this address - he may have been the first of many people to carry out this trade here. By 1888 George Chambers, a baker and confectioner, was advertising for a lad to help make dough and serve in the shop and in 1899 the bakery was replacing its oven with a larger one. Mr Chambers came to Cheltenham in his youth and his shop was very popular with the boys from Cheltenham College in the days before their own "tuck shop" was established. In his obituary, in 1929, he was said to have been a very kindly and good-natured man. Mr J. Lock baked here from the early years of the 20th century until 1915. He was followed by Mr William Walter Lewis, who in 1917 was fined 2s 6d under the Cake and Pastry Order for displaying jam tarts - with jam in them! During the war the fear that Britain could run out of food sometimes led to panic buying and shortages. The Ministry of Food therefore decided to introduce rationing, starting with sugar (and hence jam). Lewis’s bakery was a family concern and whilst Mr Lewis baked, his wife Emily ran the shop. Mr Lewis was a short jovial man who used to wear his white hair Shakespearean style with a curl at the back. One of the bakery’s specialities was a bun called a buster, a triangular shaped bun with currants in it. 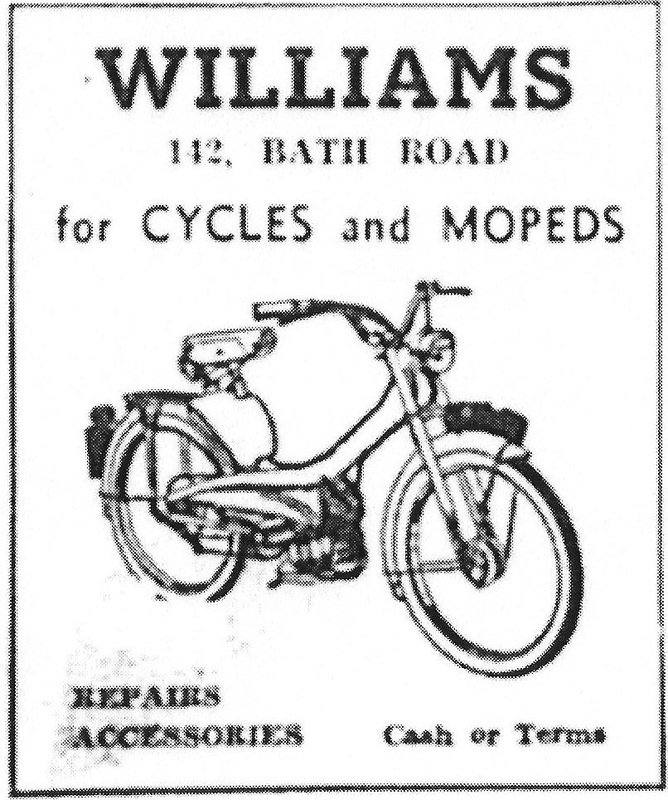 A complete change occurred in 1936, when the premises became the Bath Road branch of the cycle dealer A Williams and Co, whose main shop was in Portland Street. The manager here was Mr Frederick Ernest Meadows. 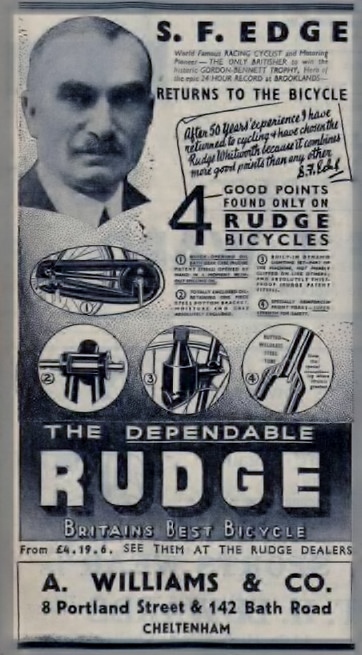 Mr Meadows was born in Gloucestershire in 1905 and one of his first jobs was with the cycle dealers, Halfords. It was Halfords policy to move staff between branches and for Mr Meadows and his family this included Hereford and Newport in South Wales. After several transfers, Mr Meadows decided to return to the county of his birth. 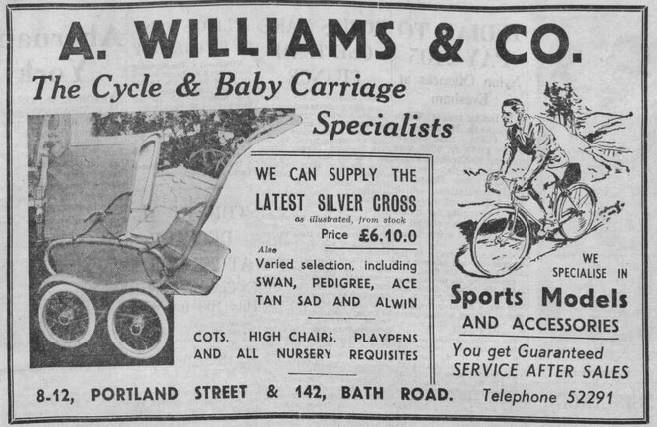 The family moved back to Cheltenham and Fred began work with another cycle dealers, A Williams and Co. The family lived over the shop in Bath Road. There were two workshops where he did the repairs, the smaller of the two was at the rear of the shop. Mrs Meadows minded the shop when he was out collecting, returning or testing bicycles. The main sources of repairs were the many delivery bicycles used by the traders in the Bath Road. All the usual bicycle spares and accessories could be purchased from here - puncture repair kits, inner tubes, tyres, cables, bells, brake blocks, etc. These sales and payments for repairs were recorded by writing on a paper till roll, to be added up on a Saturday evening. Mr and Mrs Meadows lived over the shop until about 1957. Around the same time 140 Bath Road, next door (formerly the pub and latterly a private dwelling), became vacant. Williams and Co bought it to expand the business. Another manager was brought in for the new part, which sold nursery equipment, leaving Mr Meadows with the cycle department and repairs. Eventually the other manager took over both parts of the shop. Mr Meadows continued doing repairs, but now he was based at the Portland Street shop. He carried on working until he was seventy years old, dying in 1978, three years after retiring. Mr and Mrs T L Chung were the next owners and they opened their Chop Suey House in the early 1970s. During the eighties it was the business of Parry’s greengrocers and general store. After being empty for some years The Natural Grocery Store, an organic food shop, opened here in May 1998. 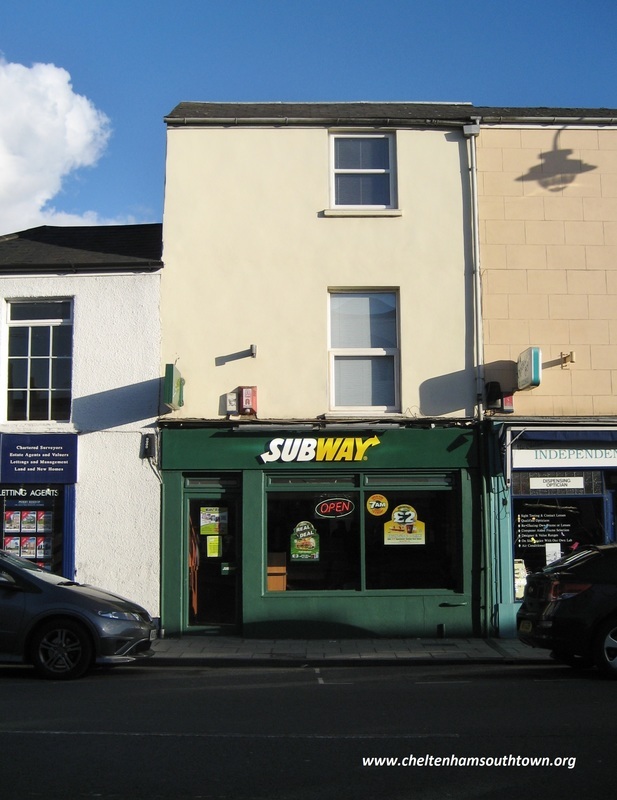 This relocated to 150 Bath Road in 2003 and these premises are now part of the Subway snack food chain.